Mary V. (Cozzolino) Elia, 80, formerly of Schenectady, passed away suddenly on January 6, 2018 in Azusa, California after a long and valiant battle with Alzheimer’s disease. She was the daughter of the late Ralph and Margaret (Paolucci) Cozzolino. She is survived by her two loving sons, Michael Elia (Eileen) and Scott Elia (Amy) both of California, grandson Craig Elia and granddaughter Brooklynne Elia also of California, her loving brother Ralph Cozzolino of Schenectady and loving sister Ann Boyens of Scotia and nieces Alison Cozzolino, Lynne Boyens, Lauren Cote and Angie Cozzolino. She was predeceased by her brother Frank Cozzolino and her brother Dominick Cozzolino and companion Douglas Hart. She was employed as a traffic manager in television broadcasting at WMHT Channel 17 in Rotterdam for many years. Mary was known to many as an opinionated and fiercely passionate lady who loved her family more than anything else. She was a cat lover and was very proud of her beautiful herb garden in the yard of her long-time home in Woodlawn. Her favorite color was pink and she enjoyed music and was a voracious reader her whole life. In later years, her brother Ralph was a constant source of support and a loving caregiver. Mary was a graduate of Mont Pleasant High School and St John the Baptist school and attended classes at Schenectady Community College. 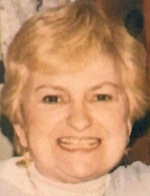 Mary was a member of St. Anthony’s Church in Schenectady. Donations may be made in Mary’s name to the Alzheimer’s Association at www.alz.org.